World War II looms so large in the collective American memory that the global conflict that preceded it is often overlooked. But the role U.S. soldiers played in World War I — also known as the Great War — was no less significant. The war cost many of them their lives, and an art installation at the National WWI Museum and Memorial acknowledges their sacrifice. 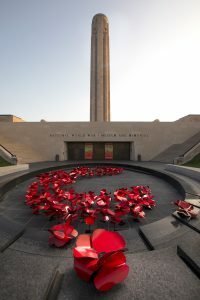 “Reflections of Hope: Armistice 1918,” presented in observance of the centennial of the war’s end, features 117 metal poppy sculptures, each representing 1,000 American casualties. The sculptures were designed by Ada Koch, an artist whose work has addressed social issues including war and violence. “I like to call it disruptive art that makes people stop and think,” Koch said. “Reflections of Hope” is “taking a war that was literally100 years ago and still making it relevant to the community.” The poppy sculptures are on view in the museum’s Reflection Pool. “For me, the poppy is about hope and rebirth and remembrance,” Koch said. “I wanted to do something big and impactful.” Ideally, she said, the art installation might attract people who hadn’t planned to visit the museum. In her research of art themed to war, Koch said, she has come across quite a few poems and “In Flanders Fields” is “a pretty classic one.” Last year, she renewed her ongoing artistic relationship with poet Glenn North for the exhibition “Love, Loss & Violence: A Visual Dialogue on War” at the Kansas City Artists Coalition. Koch left behind a career in business to study painting at the Kansas City Art Institute. She has a studio in the Livestock Exchange Building and her work has been exhibited around the U.S. and in Italy, including recent solo shows at the Kansas City Artists Coalition and the Leedy-Voulkos Art Center. These days, she said, her art responds to American culture. “Sometimes, I’ll do landscapes of New York City or Washington, D.C., or Kansas City,” she said. “But most of my work lately has tended to have political influence. “Reflections of Hope: Armistice 1918” continues at the National World War I Museum and Memorial, 2 Memorial Dr., through Nov. 11, when the poppies will go on sale. For details of how to purchase, contact give@theworldwar.org. For more information about the exhibit, call 816.888.8100 or visit theworldwar.org.